This is an ALL HANDS/ Mandatory Drill. 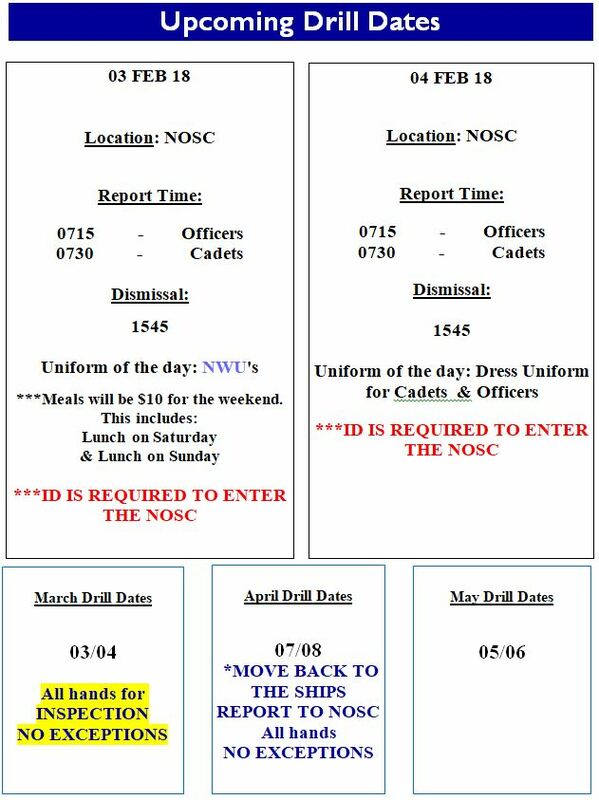 We will have a formal Inspection on 04FEB2018 at 1430 on the drill deck at the NOSC. Parents are invited to attend; new parents are encouraged to attend so you can experience the Annual Inspection. Saturday will be our final chance to square away any uniform issues that might have arisen over the past month (which we should not have any). Remember uniforms must be perfect, shoes shined, neckerchiefs ironed and rolled tight with a perfect square knot, covers bright white & NO White socks in the Dress Blue Uniform. We will be joined by LCDR Steve Adams who is our Regional Director, USN Retired CDR Wayne Sorrentino who is our Navy League Council President. USCG Retired Capt. Brian Roche who is the Executive Director of the Buffalo Naval Park. Reminder Winter Training is Right Around the corner. All Orders & Training Fees $125.00 are due 03FEB2018 right after muster. We will be joined by 2 cadets from upstate NY units; so those attending this training I expect you to make them feel welcome; when we are up at the park in the cold weather. Parents remember you must have valid ID to enter the NOSC. Please note as of 01 Jan 18 Dues are now $125 per year. REMEMBER, even if it is not an overnight drill, you are still required to have a sea bag with the necessary contents. Meals are $10 per cadet for meals. Please make sure you have your money. Exact change is preferred. Thank you. Remember each and every one of you is our best recruiter. If you would like to bring a friend/neighbor/relative who is interested in joining, let LT J. Pawli know in order to pass along the information about the program to them. Shooting will be on Thursday, 08 FEB 18, at 1900. 10 cadets are needed. Cost is $11.00; please bring exact change. See the Midshipman Simone/LT J at drill if you want to sign up. Must be 12 or older to attend shooting. February 3 & 4 – Drill and date for inspection – All hands event NO EXCEPTIONS ON THIS EVENT. April is usually the month we do our annual pancake breakfast. I will update everyone as soon as I have full details. Don’t forget to shop at Amazonsmile.com to help us raise funds. Just go there choose The Sullivans Division as your charity and shop as always. A small percentage of your purchase goes directly to the unit. No selling involved! Also keep in the loop of events, drill dates etc. by using Remind! Looking for a galley cook for drill weekends. If you can make the commitment please contact LT Melanie Pawli at 716-892-0769 or mdpawli@msn.com for more details.